The debut issue marking the return of one of the most influential characters in Comics History comes this October with "Miss Fury – Joy Division." Multi-Eisner nominee Billy Tucci (Shi, Sgt. 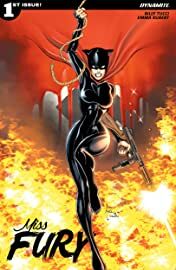 Rock) and rising star Emma Kubert recapture the legend of the original "Cat Woman" Marla Drake and her army of "Black Furies" that take readers from the warring skies above NYC and into the heart of Hitler's Third Reich in spirit of an all-female "Inglourious Basterds."